Hmm, it seems that I found more toys during CE Week! TOMY had a couple of goodies that caught my eye. One might be blatantly obvious why I stopped to take a look. I was first introduced to the next-generation of the Battroborg Warrior line. TOMY is continuing Battroborg Warrior’s motion control battling but have included weapons with their warriors. The revolutionary robots feature interchangeable weaponry that takes battle play to a whole new, customizable level. Players choose their Warrior from themes including Samurai, Ninja, Knight and Viking, then customize and outfit them for battle with interchangeable weapons. The single-handled katana blade controller challenges players to perfect their swordsmanship; as players slice and cut with the katana controller, the Battroborg Warriors are thrust into battle. The new Warrior Battle Arena adds to the challenge with working trap doors, and spring-loaded training flags help players master the art of motion control. 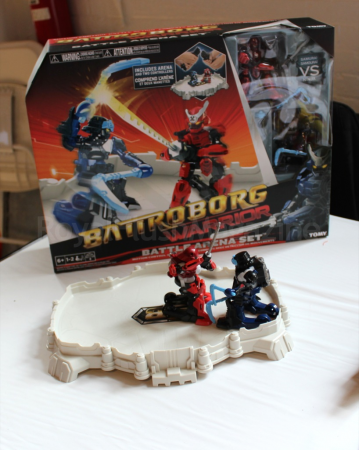 TOMY’s Battroborg Warrior Battle Arena with 2 Warriors costs $69.99 and the Battroborg Warrior Single Pack is available for $29.99. Recommended for ages 6 years and up. Be sure to visit http://Battroborg.com for more information. You can also “Like” Battroborg on Facebook and follow Battroborg on Twitter. And now on to Pikachu! With TOMY’s Battle Ready™ Pikachu™, your kids (or even yourself) can have Pikachu on your shoulder. But the fun doesn’t end there, TOMY has expanded their Pokémon line to include a variety of role playing toys! Battle Ready Pikachu – I choose you Pikachu! Pikachu launches foam discs either off your shoulder or on a tabletop or floor. 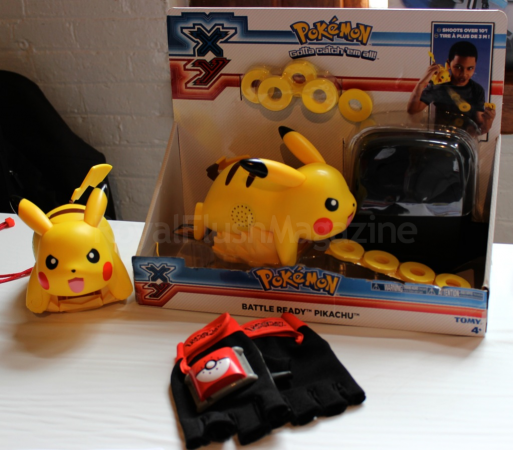 Includes Pikachu, an adjustable backpack harness with storage compartment, eight foam discs and two button cell batteries. Let the battle begin! Pokémon Trainer’s Kalos Region Pokédex has electronic sound effects, multicolor light effects, accurate styling, and physical-mode transformation. Pretend to scan your Pokémon figures by opening up the Pokédex, hold it up to a Pokémon figure and continuously push the button on the side for the light effects. This looks like a scene straight from the animation! Includes three AAA batteries. Trainer Gloves with Sound – Get ready to become a Pokémon Trainer with Ash’s gloves! These gloves are motion activated, so when you pretend to throw your Poké Ball into battle, you hear four different sound effects. For more information regarding Pokémon, feel free to visit http://www.pokemon.com/.